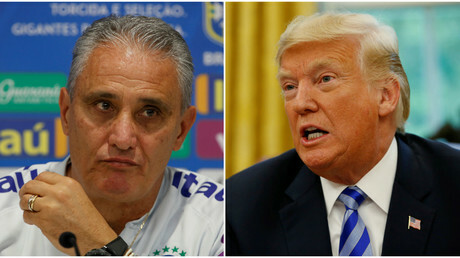 Brazil manager Tite has fired back at Donald Trump, suggesting he be “more well informed historically” about the country’s five World Cup wins after the US president poked fun at the team’s paltry showing at the 2018 tournament. During a White House meeting with FIFA president Gianni Infantino to discuss the 2026 World Cup, which will be held in the US, Canada and Mexico, Trump enquired as to which country an impatient reporter in the gathered press hailed from. Brazil exited at the quarterfinal stage 2-1 to Belgium in Russia. When asked about the comments on Monday, Tite, who was at the helm for the tournament, seemed to be in no mood for giggles. Instead, he calmly and silently raised his open palm to the reporter showing his outstretched five fingers, symbolizing the Samba Boys’ record haul of five World Cups. “For him, if he doesn’t know, I can show him. We have five World Cups. Maybe he should be more well informed historically,” was the 57-year-old’s stoney-faced response. Brazil will get a chance to rectify their Russia heartache and attempt to win their sixth world crown in eight years’ time when the US host the tournament jointly with their North American neighbors Canada and Mexico. Trump, however, will not be in office by the time the tournament comes around.